I am very excited to be today's stop on the TLC Book Tour for Where the Forest Meets the Stars, the debut novel by Glendy Vanderah. Accompanying my review is a bowl of very Cheesy Cauliflower, inspired by the book and the mysterious child, Ursa. I signed up for this book based on the description and somewhat on the comparison to The Snow Child, a book that I want to read, but I confess, still sits on my Kindle--unread after several years. 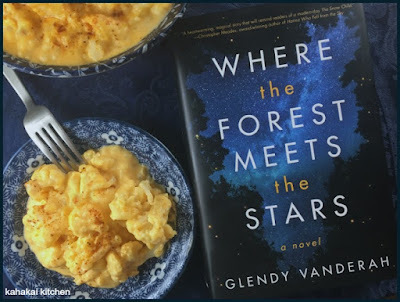 Although I can't speak to the comparison being accurate, I can tell you that I very much enjoyed Where the Forest Meets the Stars and that it is a beautifully written book that had me fully caught up in the story and characters and kept me turning the pages. 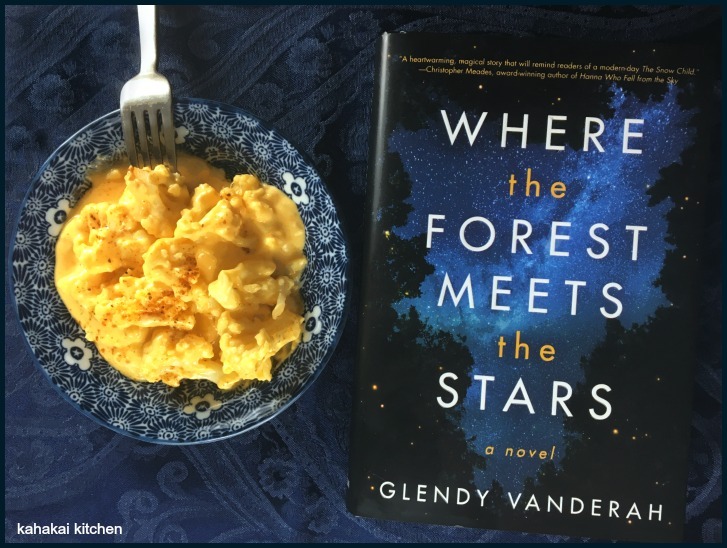 Magical realism can be tough to write without it traveling over to the unbelievable, too much woo-woo side, and for me, Glendy Vanderah had a deft touch that had me truly wanting to believe that Ursa really comes from the stars, or at least has something magical about her. She is a special character, wise beyond her years, funny and engaging, and that makes it easy to imagine why a practical scientist would keep her hidden and why a hurting, reclusive neighbor would help her. I also liked Jo and Gabe and how they come together with Ursa, the trio forming bonds as each works through the hurts and damages that life has given them. The story had me smiling and tearing up in almost equal parts as Ursa looks for her five miracles--things that other people might overlook in the search for something bigger, but that a child (whether human or from another world), would see the beauty and magic in. Although I have not spent time in the rural areas of Southern Illinois, the author brings the settings with the rustic rented cottage, the forest and landscape surrounding it, and Jo's bird study sites to life beautifully. 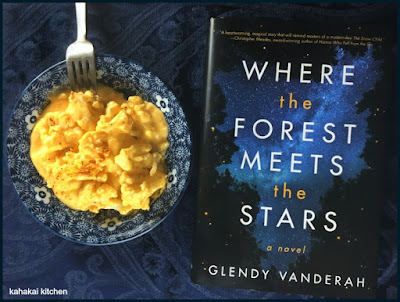 Where the Forest Meets the Stars is a special book, one that I found easy to curl up and get lost in, and one that I wanted to go back to after I finished, to spend more time with the characters. I can't wait to see what Glendy Vanerah writes next. 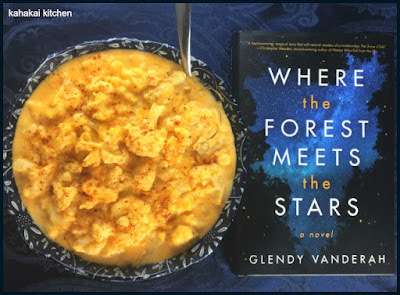 If you would like to win a copy of Where the Forest Meets the Stars and you have a U.S. or Canada mailing address, head over to my Instagram account @DebinHawaii for a chance to win. Author Notes: Glendy Vanderah worked as an endangered bird specialist in Illinois before she became a writer. Originally from Chicago, she now lives in rural Florida with as many birds, butterflies, and wildflowers as she can lure to her land. Where the Forest Meets the Stars is her debut novel. Connect with Glendy on her website or Instagram. There was a lot of food in Where the Forest Meets the Stars, much of it cooked over the fire pit at the cabin, including marinated chicken breasts and vegetable skewers, turkey burgers, toasted marshmallows, grilled mahi basted with butter and vegetable skewers. There was also apple cider, oatmeal, tuna sandwiches, trail mix, fruit, blueberry muffins, scrambled eggs with "green stuff" (aka spinach and/or broccoli), apple pie, leftover beans, rice, and chicken, coffee, cereal, pancakes with syrup, orange juice, peach and strawberry-rhubarb pie made with farm stand fruit, potato salad from Jo's mother's recipe, burgers, pork chops, applesauce, and green beans, Raisin Bran cereal, wine, iced tea, milk and cookies, pizza, Necco rolls, turkey burgers with sweet potato fries, turkey and cheddar sandwiches, omelets with Gabe's eggs, roast chicken and packaged bread stuffing, leftover green beans and corn, beer, cheese and crackers, fried eggs, English muffins and orange slices, tomato soup, a chef's salad, dutch apple pie and vanilla ice cream, a spaghetti dinner, chili and cornbread, egg sandwiches, roast beef, and sandwiches and lemonade. "Gabe brought leftover cauliflower in cheese sauce for dinner. 'Can I eat dirt instead?'" 'Thanks,' Jo told Gabe. 'You've set the bar way too high for my simplistic cooking skills.'" Between Ursa's yuckyflower comments and the fact that my friend was talking about a keto-friendy cheese sauce she made that was giving me serious cheese sauce cravings, I picked it as my book-inspired dish. I like cauliflower already, but enough gooey cheese sauce (and I put plenty of the sauce recipe below on my steamed cauliflower) would make it palatable for a child or anyone who found it "yucky." Melt the butter over medium heat in a medium sauce pan. Add the cream cheese and stir until it has melted into the butter. Whisk in about 1/2 cup of the milk, turn heat to medium low and add about 1 1/2 cups of the shredded cheese, stirring until melted and smooth. At this point, you can play with the consistency of your sauce, adding more milk and/or cheese as needed, until you get a smooth, creamy, pour-able sauce. 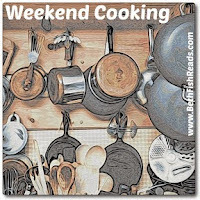 Turn the heat to low whisk in the yellow mustard and Tabasco, if using, and taste for seasoning, adding salt and pepper as desired. 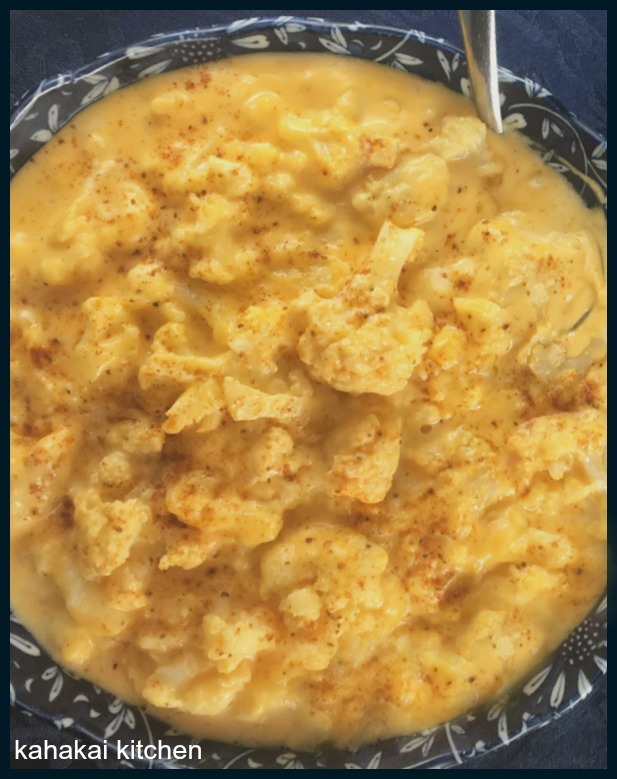 Notes/Results: OK, this cheese sauce, especially when you are lazy and use it all on a small head of cauliflower, isn't going to win low calorie or low fat health awards, but it is delicious. I'm not doing a keto or low-carb diet, but I appreciate a cheese sauce that is thick and creamy without having to use flour or cornstarch and bother with making a roux. I gobbled up a bowl for dinner the first night I made it and I have been enjoying the remainder-reheated with eggs on top and as a side dish for fish. I will happily make it again. 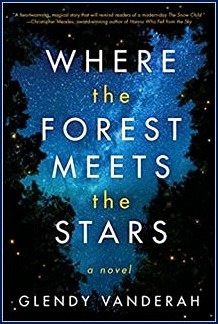 Note: A review copy of "Where the Forest Meets the Stars" was provided to me by the author and the publisher via TLC Book Tours. I was not compensated for this review and as always, my thoughts and opinions are my own. I just picked up a copy of this for my daughter's Easter basket and I've got some time to read it before she sees it! Thanks for being on this tour! The cheese sauce looks pretty yummy (even if not particularly low-cal). Still I sometimes find myself with leftover cream cheese from another recipe and this would be a delicious way to use it up. I've had my eye on this book, but haven't gotten around to reading it. Very delicious-sounding recipe. I love those flavors. I think I'll pass when it comes to reading the book, though. I'll be picking up a copy of this book eventually, it looks really good! I enjoy magical-realism but totally agree with you when it gets to that "woo-woo" state! :) Delicious looking dish! I am such a fan or cauliflower- and it turns out to be the low carb substitute for everything.